On March 19th, 2010, after Donovan's concert at El Rey Theatre in Los Angeles, there was an auction to benefit David Lynch Foundation. The prize was 5 hours with Donovan. Craig Poletti won the auction for the incredible price of $4500. I attended the LA show and it was terrific. It was a pleasure to meet Donovan, Linda and Astrella after the show. However, the highlight for me was I was the lucky winner of an auction to benefit the David Lynch Foundation. The grand prize was a one on one visit with DONOVAN !!!! The following week we met for breakfast... and talked for about 90 minutes. His stories of his years in the music business and his friendship with the Beatles and others were intriguing. We then visited the Grammy Museum in Downtown Los Angeles. 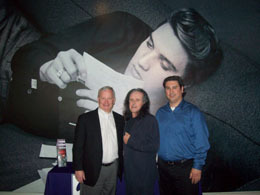 Donovan had a youthful enthusiasm for the museum, especially an exhibit of newly discovered photos of Elvis Presely when he was 21 years old and just beginning to achieve fame. 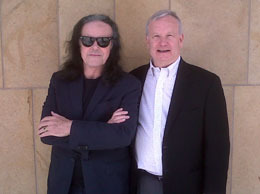 Donovan was personable, gracious, engaging, humorous and interesting beyond belief! His knowledge of the history of music is amazing. We concluded our visit with Donovan telling me about the wonderful work of the Foundation. I can tell you he is as passionate about their work as he is about his music. It was a wonderful experience and I felt that I was representing all Donovan fans who would have been as thrilled as I was for the opportunity. Many thanks to Donovan and the David Lynch Foundation! Thanks to Craig for sharing this!